I'm in the midst of reading Room by Emma Donoghue, which is told from the perspective of a young boy, Jack, who turns five years old at the beginning of the novel. Many of the words in Room are capitalized as if they're proper nouns, such as "Room", "Wardrobe", "Bed", "Skylight", "Lamp", and of course, "Ma", which cleverly signifies their importance as names in the young protagonist's world. Since I haven't encountered any "hard words" in this book, my words were taken from my handy 365 New Words-a-Year calendar. 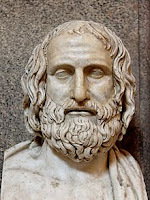 Ancient playwright Euripides is often criticized for his frequent use of the deus ex machina. Deus ex machina literally means "a god from a machine". This stems from the practice of using a crane to hold a god (or gods) over the stage in ancient Greek and Roman drama, to resolve the plot. In writing, this device is often frowned upon as a gimmicky, contrived, or implausible way to resolve matters. As a child in NY, I noticed that some buildings with elevators did not have a 13th floor, which was due to triskaidekaphobia. Appropriately, this was the calendar's word of the day last Friday, September 13. The origin of the fear of this number is not clear, although some think it stems from the Last Supper, when Jesus was betrayed afterward by one of the thirteen present. This fear has been prevalent enough to require a word to describe it. The word was formed by adding the Greek words for thirteen, treiskaideka (minus the first e), to phobia. Although I can never seem to remember its meaning correctly, I've come across this word before, and associate it with teeth, for obvious reasons, and more specifically with the word "toothy", which means having or showing many or large teeth (as in "a toothy smile"). Interestingly, the next word in my calendar, for Thursday, September 19, is "meme", which is defined as an idea, behavior, or usage that spreads from person to person. For information about memes for book bloggers, please visit my Memes page. 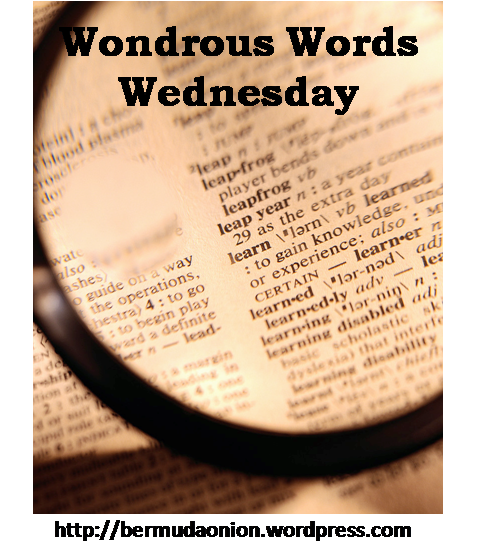 Hosted by Kathy from BermudaOnion's Weblog, Wondrous Words Wednesday is a meme that motivates us to learn about words. What new words have you discovered recently? I love your photo with the calendar pages! Triskaidekaphobia is quite a mouthful, isn't it? I don't think I've ever known anyone who suffers from that. Thanks, Kathy! I'm hoping I'll remember how to spell it properly! I do like triskaidekaphobia. And how appropriate that meme was the next work in the calendar. Great new words Suko! The pic just reminded me, how's the puppy doing? Yes! Glad Daisy is doing well! I listened to the audio version of Room so I missed the visual effect of the capitalized words. I suppose that's to give them more importance from Jack's point of view. Triskaidekaphobia is a good word but hard to pronounce! I agree, Brian. At the time, this device was innovative, and it reflected the beliefs of the day. I'm happy that you explained the origin and proper definition of deus ex machina. Have seen it before but until now didn't really understand its exact meaning. Thanks for sharing these words. Thank you for your comment, Rita. I've heard of deus ex machina before, but never known what it meant. I've seen that fear of 13 word before, but find it simply too long to remember! 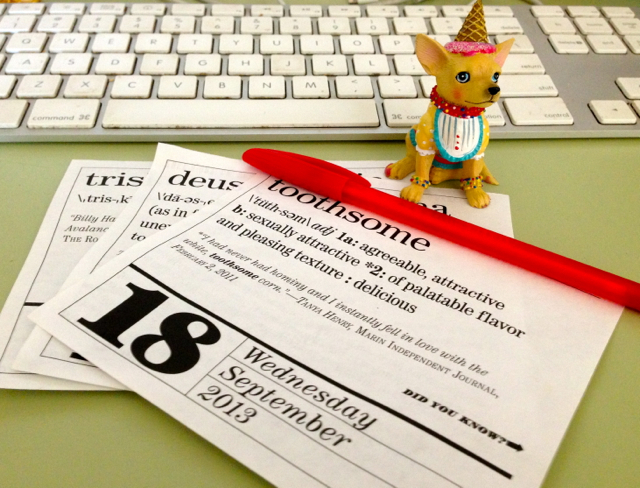 Toothsome is a great word. Great post, Suko.Very interesting to read. You asked about the images in the sidebar on blogger. I haven't noticed any problems. I've heard Room is quite good, an unusual story. I like a lot triskaidekaphobia ! I searched on the web and saw it's the same in French : triskaÏdekaphobie : Thanks for his new word I never saw before ! These are both new to me words so thanks for sharing. I can't wait to hear your thoughts on Room as I have it on my own shelves patiently waiting to be read. Enjoy!